The launch of the AEC looks set to occur amidst a rather dreadful backdrop. A grand entrance by the ASEAN Economic Community (AEC), when it launches in less than nine weeks, onto the world stage was supposed to herald the dawning of a prosperous new age for the more than 600 million people who live within the region. But the political realities are already delivering a different, unwanted take. Bad? Even Southeast Asia’s harshest critics are trying hard not to crow over the latest debacles, for fear of tempting fate with the region’s notoriously thin-skinned leaders. Most telling is the toxic smog which has been allowed to escalate for 20 years. A Wall Street Journal report quoting Greenpeace says 110,000 people die annually from haze-related illnesses. This year’s blanket of filthy air, caused largely by land clearing for palm oil plantations, has gone beyond anybody’s wildest expectations. Yet no one corporate or executive has been held responsible. Meanwhile, a report from the Vietnamese government, which deserves to be taken seriously, estimates the fish catch from the Mekong River Basin will halve if Laos presses ahead with its extraordinary dam construction plans. About 60 million people in downstream countries rely on the Mekong River for their livelihood and protein. The overwhelming majority are already dirt poor. Only three groups of people favor the construction of dams across the Mekong River without adequate regard for these considerations – Thai power companies, European construction companies and the Laos’ communist party which runs the government. It’s a similar tale further south, where Malaysian- and Singapore-listed palm oil companies, hedge funds and the politicians that run them bear responsibility for causing the catastrophic fires in Indonesia. Those responsibilities should also include damage to people’s health, business losses and the environmental devastation caused by the fires. Likewise, downstream villagers along the Mekong River – the world’s largest fresh water fish supplier – need to be indemnified against future losses. That should at least be addressed within the context of ASEAN-related institutions like the AEC, and of course, it will not happen. 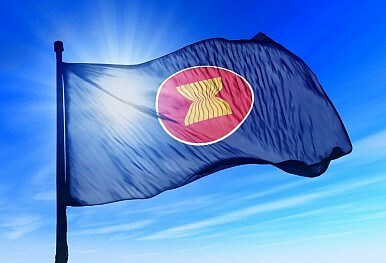 ASEAN skeptics argue the “ASEAN Way and Rule of Law” has always been anything for a profit. They also claim Indonesia will never take the 10-nation trading bloc seriously because its size and self-perceived political clout means it doesn’t have too. Cambodia has already bowed to China and Laos is close to doing so – thereby testing their foreign policy priorities. More importantly, clean air and food security – two of humanity’s basic commodities – has further factionalized the AEC before it even starts. Unprecedented internal strife is also afflicting many of the region’s countries amid an economic downturn that is humiliating China and shows signs of spreading. Royal succession issues and a military coup continue to dog Thailand. Meanwhile, financial debacles within a society deeply divided by religion and crony capitalism has brought Malaysia to its knees, as it has in Myanmar where pending elections are unlikely to resolve decades of military mismanagement. On Monday, outside the Cambodian parliament in broad daylight, two opposition lawmakers were dragged from their cars and bashed senselessly. It’s a dreadful backdrop for the launch of a regional trading bloc and hardly a poster-boy image the ASEAN secretariat in Jakarta wants to see leading the news bulletins around the world. Still there are no shortage of government-friendly press barons here who are prepared to extol the virtues of the AEC while playing down the toxic shock – that might as well be on par with a chemical weapon – as an irritating haze accidentally bought on by indolent farmers skilled in slash and burn. In Southeast Asia, children are choking to death, grounds for an inquiry with relevant charges to follow, but ASEAN governments and companies have again done as little as they can, with some simply remaining focused on the bottom line of their respective P&L accounts. Given this backdrop, ASEAN leaders arguably deserve to be pilloried by the Western media, held to ridicule in the United Nations–with sanctions considered–and class action law suits prepared by their citizens in world courts for failing to protect the air that they breathe and the food they will need. Indonesia’s former foreign minister Marty Natalegawa’s new book on the regional grouping’s relevance grapples with its manifold challenges.